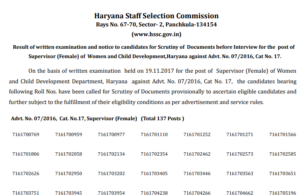 Haryana Staff Selection Commission has announced the HSSC Female supervisor result 2018. 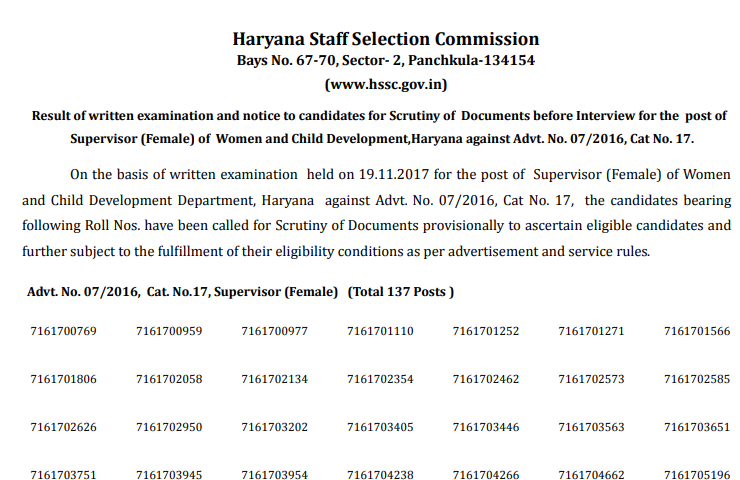 The result of written examination of Supervisor (female) posts of Women and Child Development, Haryana has been declared on www.hssc.gov.in. The Commission has issued the list of selected candidates and they all have to appear for scrutiny of documents before the interview. For the recruitment to the 137 posts of Supervisor (female), the written examination was conducted on 19th November 2017 against advertisement number 07/2016, Cat No. 17. The next procedure is of document verification after which, eligible candidates will be called for the interview. Important: Scrutiny of documents will be organised on 12th September. Shortlisted candidates have to report at 9 AM in Commission’s office Bays No. 67-70, Sector- 2, Panchkula. Candidates have to bring all the original documents along with the one ID proof and a copy of downloaded application form. The number of candidates to appear for the interview would be two times the number of vacancies. Thus, if a candidate is found eligible it will not confer any right of the interview. Note: If a candidate does not appears for the scrutiny of documents (due to any reason), he/ she will not be considered for the personal interview and won’t be allowed to avail further opportunities. First of all, candidates must know on which website the results have been announced. Candidates need to visit www.hssc.gov.in. After reaching the home page, candidates have to press the “Result” link provided in the top menu. Then, aspirants will be redirected to the next page, where links for the all the results published recently is given. The first link is for HSSC Female Supervisor result 2018.
candidates can download the PDF file. In that PDF file, roll numbers of all the candidates selected for the next level – scrutiny of documents is given. Note: Candidates should bring all the required documents. And, report at the venue on time.